You are SUCH a little stinker. Look at you. Stinking up the place. Ew! Annie M.! via HAPPYLOLDAY. Photo by LadiesWhoKill. shhhhhhhhhh..........let the wee one sleep.......and a kiss on the wee nosey-la!!! They don't smell when they are really little- do they? Oooooo, it is so wittle and kitten-y! I wonder if skunks make good pets... I've heard they can be 'de-scented', but can they be happy as indoor animals and mingle with other critters? Allo, bah-bee! Ah am ze Pepe lePew, ze Seconde! Ah may be le ty-nee, but ah am not zo zmall for ze woo-weeng, non? Is there a rule "When it fits in the palm of your hand, it's cute"? And if this isn't a rule shouldn't it be one? Skunks don't make good pets, like any wild animal. Yes, they can be de-scented, and I've known of some people who had it done to abandoned babies they adopted, or injured animals they took in to care for. They are raccoon-y in their craftiness and inquisitiveness. They are pretty energetic, and even de-skunked, they still smell - not as bad, but they have a definite skunky odeur about them. They are like big stinky ferrets, from what I understand. Skunks do make good pets. They're like cats. Never take one from the wild though...there are people that breed them and there are alllllll sorts of cool colors you can get them in! Oh, and DAMN THAT'S CUTE! Omigosh, that is so precious! Not sure if I like skunks being talked about as if they were purses or shoes (you can get them in different colors?) and I'm not sure as to whether they should be bred to be pets...seems to me that either they're treated as pests (stink factor) or they should be left alone in the wild. IJ beat me to it. And if you can't say anything nice ... dramatic pause ... don't say nothin at all. I'm going to err on the side of caution. Aw what an adorable stink pot! Keesy keesy on his wee little haid! they brought a de-stanked one to my school once when I was little. He was tame. I don't remember him stinking! But I do remember they warned us that they have very sharp teeth! actually we had a pet (descented) skunk when I was a child. I wouldn't do that again, nor necessarily recommend it to others (though I won't heap flaming excoriations on people who want or have pet skunks). He really didn't seem temperamentally suited to pethood, which was something we (my family, anyhow) really didn't understand 35 years ago. But he was a pretty darn cute little guy, I have to say. "Whatcha doin' in the human's hand? Hibernatin'?" Ohhhhhh myyyyyyy. That is a darling-picture-perfect-curled-up-look-how-cute-it-is BEHBEHHHHH! PS I am not insane, really. More photos of baby skunks in the link above/below? That is not a skunk. That is a little black kitty who got run over by a line painter. I think something a long the lines of "youthful fluffulence" should make another rule of cuteness! The way the little wisps of fur stick up while his back is rounded (reminiscent of a kitteh) are too adorable! OR maybe just a rule that says "When wisps of your fluffy hair stick up while your back is rounded, it's cute." Right?! Skunk (with her own brood of anerable little babies) that always came into our front yard at night. I just want to kiss him on his perfect Disney skunk nose!! Single or double stripe? IIRC, the double stripes are on the decline, or a least much rarer. But,what is life without a dash of exotic perfume? Yesterday, our dog got into the Snausages and ate everything that was left - about half a tub. There is NO WAY that any skunk could smell as bad as her doggie farts right now. I have had three pet skunks in my life, and yes, I'd say they make good pets for the right person. They're NOT as craft as a raccoon, and they do NOT smell bad. They have a faint (VERY faint) musky smell to their fur, but they do not stink. They use litter boxes like cats, play with toys like cats, and enjoy being with their humans just about as much as dogs do! You have to think a lot before you get a pet skunk, because they aren't legal in all areas, and when they are, you may need to get an official permit and have your home inspected yearly. You also need to keep records of everywhere you take them, and if they bite someone, they will most likely be euthanized to check them for rabies. 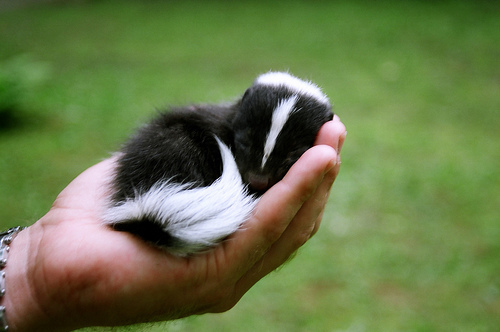 Skunks become very attached to their humans, and love to play with you. If you feed them right, help them exercise, and understand that, while they're not as pesky as raccoons, they do get into things sometimes, you can have a wonderful relationship with them. My guys generally like to take walks on a harness and leash in the back yard, play with cat toys and beanie babies, and my baby especially just wants to be snuggled. There's no reason that a well socialized skunk can't be a wonderful member of someone's family. And btw--skunks only spray in self defense. A wild skunk will try to run away from you first, and if they have enough contact with you they'll learn not to even care if you're around. They don't just "stink" ever. Skunk means something entirely different to me. Oh, the cuteness! It makes my teeth hurt!! This is pretty crazy timing - just last night I ran into a baby skunk right outside my front door (and I'm in Chicago!). I came about 2 feet away from the little guy before I noticed him...and even then it took me a minute to compute since it's not usually something you see in the city. I did kind of yell a little - but he just kinda looked at me before running off. Definitely didn't spray. If I could have picked him up like this little fella I probably would! This? Right here? Imagine five of them living under your shed. Uh-huh. They were adorable, following their mom across the yard at dusk with their little teeny tails in the air. This is why I never had a strawberry harvest. These little buggers always ate them before I could. Awww!!! I've allways thought skunks were adorable animals, this just solidifies it to me. Bebee skunks? I'm trying to pet the little skunkie head thru the monitor! I had one of these little $hits bomb the crawlspace under my house once. I think it may have been cornered by a cat. Took months to get the smell out, it was horrible. They may be cute but they are not to be messed with! I think a live skunk would be the most effective method of crowd dispersal. Forget tear gas, drop one of these little guys in the middle of a crowd and watch everyone run for cover! watch out... to some people "big stinky ferret" is an endorsement. We have three little girl skunks at the zoo, and they are seriously the cutest things I have ever seen. Their tiny little heads, their digger claws, floofy tails (and removed scent glands) and they love being held. N'awww, this wee anerable tyke couldn't possibly smell like anything but cookies. Oh, that is just so precious with its super tininess and its curled floofy tail!!! I've heard skunks make good pets and I think I even saw a skunk show on TV once - like a dog show - seriously. I saw a program on Animal Planet about skunks as pets (I think it was a small segment of a whole skunk program or something). They seemed aloof, didn't desperately clamor for attention, and sometimes playful (kind of like a cat). And the only "cool color" I saw was albino, which was actually very pretty! I think there may have been a few red ones but I'm not sure. Btw, the eye capsules! So adorable!